Preheat oven to 375º. Grease a large baking sheet and set aside. In a large skillte, cook sausage till brown. Drain well. Add onion, and peppers to the pan and cook about 4 minutes or so. Add the garlic and Italian seasoning. Return meat to pan. Remove from heat. Divide dough in half. Roll out inot a rectangle about 10×14. Spread ½ the sausage mixture across dough leaving a 1″ border. Layer ham, pepperoni, and cheeses. Roll up, jelly roll style. Pinching edges to seal. Place on baking sheet. Repeat with other half of dough. Let dough rise about 20-30 minutes. Brush top with egg wash. Bake until nearly completely golden brown and starting to crisp, about 20 minutes. 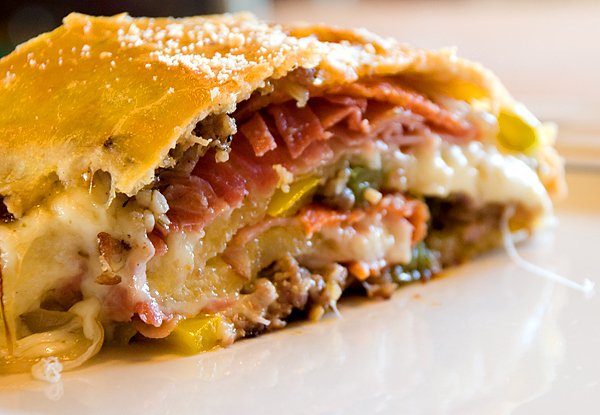 Sprinkle each Stromboli with Parmesian and return to oven for another 5 minutes. Let stand 10 minutes. Slice thickly and serve.